Shanghai Hongqiao International Airport (IATA: SHA, ICAO: ZSSS) is one of two international airports of Shanghai and an important airline hub of China. Hongqiao Airport mainly serves domestic and regional flights, with limited international flights. It is located near the town of Hongqiao in Changning District, 13 kilometres (8.1 mi) west of downtown, and is closer to the city center than Shanghai Pudong International Airport, Shanghai's main international airport. Hongqiao Airport is a hub for China Eastern Airlines, Shanghai Airlines, Juneyao Airlines and Spring Airlines. In 2016, Hongqiao Airport handled 40,460,135 passengers, making it the 7th busiest airport in China and the 45th busiest in the world. By the end of 2011 Hongqiao Airport hosted 22 airlines serving 82 scheduled passenger destinations. The construction of Hongqiao airport was started in 1921. In May 1923, the airport was opened for mixed civilian use. 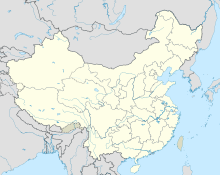 In 1937, Hongqiao was the site of the so-called 'Oyama Incident' in which a Japanese lieutenant was shot dead by Chinese Peace Preservation Corps soldiers in the lead-up to the Battle of Shanghai. During the Second Sino-Japanese War, the airport was occupied by the Japanese and used as an air force base. Its military use continued after being handed over to the Republic of China government and, later, the People's Republic of China government. From late 1963, it was rebuilt for civilian use, and was re-opened in April 1964. A major expansion took place from March to September 1984, and another from December 1988 to December 1991. Hongqiao Airport served as Shanghai's primary airport until the completion of Pudong International Airport in 1999, when almost all international flights were moved to Pudong. 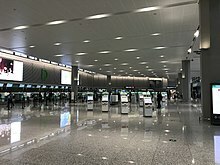 The airport presently offers mainly domestic flights, as well as five international routes to central Tokyo's Haneda Airport, central Seoul's Gimpo International Airport, central Taipei Songshan Airport, Hong Kong International Airport, and Macau's Macau International Airport. Since 1 January 2013, holders of valid passports issued by 45 countries have not needed a visa if transiting through Hongqiao Airport. In preparation for the Shanghai Expo, on 16 March 2010 Hongqiao Airport completed a five-year 15.3-billion-yuan expansion project, which included a 3,300-meter second runway and the new Terminal 2, boosting Hongqiao's capacity to 40 million passengers a year. Terminal 2 is four times the size of Terminal 1 and houses 90 percent of all airlines at the airport (Terminal 1 is now used only for international flights and Spring Airlines). With the new runway, Shanghai became the first city in China to have five (now seven) runways for civilian use (Pudong and Hongqiao combined). Starting from the end of 2014, Hongqiao Airport Terminal 1 underwent its biggest renovation since 1921. The entire project was scheduled for completion in 2017. On March 26, 2017, Building A of Terminal 1 was fully renovated and reopened to public. The old Building B was closed for reconstruction, and it was expected to be revamped and open to public in mid-2018. 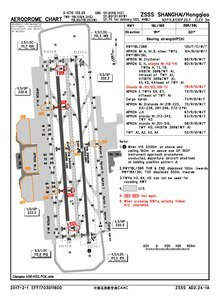 On 15 April 1999, Korean Air Lines Flight 6316, an MD-11F bearing registration HL7373, crashed shortly after takeoff from Hongqiao Airport to Seoul. After takeoff, the first officer contacted Shanghai Departure, which cleared the flight to climb to 1,500 metres (4,900 ft). When the aircraft climbed to 4,500 feet (1,400 m) in the corridor, the captain, after receiving two wrong affirmative answers from the first officer that the required altitude should be 1,500 ft (460 m), thought that the aircraft was 3,000 ft (910 m) too high. The captain then pushed the control column abruptly and roughly forward causing the plane to enter a rapid descent. Both crew members tried to recover from the dive, but were unable. All three occupants on board and five people on the ground were killed. On 13 August 2011, Qatar Airways Flight 888, a Boeing 777-300ER en route from Doha International Airport to Shanghai's other international airport, Shanghai Pudong International Airport declared a low-fuel emergency and elected to divert to Shanghai Hongqiao International Airport. Air traffic control at Hongqiao ordered Juneyao Airlines Flight 1112, en route from Shenzhen Bao'an International Airport to Hongqiao, to terminate its approach and allow the Qatar Airways Boeing 777-300ER to land. The pilot of Juneyao Airlines Flight 1112 ignored repeated orders to abort their landing and give Flight 888 priority, ultimately forcing the Qatar Airways flight to go-around. Both aircraft landed safely without injury or damage to the aircraft. The incident led to penalties to Juneyao Airlines and the crew of the Juneyao plane by the Civil Aviation Administration of China, including the permanent revocation of the pilot's license in China. On 7 June 2013, China Eastern Airlines Flight 2947, an Embraer EMB-145LI flying from Huai'an Lianshui Airport to Shanghai Hongqiao International Airport veered off of runway 18L at Hongqiao during landing. The plane came to a stop on an adjacent taxiway with its nose gear collapsed. No passengers or crew suffered any injuries, however the plane received substantial damage. On 11 October 2016, China Eastern Airlines Flight MU5643, an Airbus A320 (Registration B-2337), nearly collided with Flight MU5106 of the same airline, an Airbus A330, when the former was taking off on runway 36L while the latter was crossing the same runway under wrong instruction. The former performed a TOGA takeoff, managed to climb over the latter and avoided a collision. Terminal 2 of the Hongqiao Airport (31°11′46″N 121°19′18″E﻿ / ﻿31.19611°N 121.32167°E﻿ / 31.19611; 121.32167) is immediately adjacent to Shanghai Hongqiao Railway Station (31°11′46″N 121°18′58″E﻿ / ﻿31.19611°N 121.31611°E﻿ / 31.19611; 121.31611), a major train hub served by the Beijing–Shanghai High-Speed Railway, the Shanghai–Hangzhou High-Speed Railway and the Shanghai–Nanjing Intercity High-Speed Railway. The airport's other terminal, Terminal 1 (31°11′50″N 121°20′32″E﻿ / ﻿31.19722°N 121.34222°E﻿ / 31.19722; 121.34222), is across the airfield from Terminal 2. The proposed extension of the Shanghai Maglev Train from Longyang Road through Shanghai South Railway Station to Hongqiao would connect the two airports. At top speed, the maglev would take only 15 minutes to travel the 55 km route. Original plans called for completing the extension by 2010, in time for the Expo 2010; however, the Hongqiao extension has been indefinitely postponed due to protests. ^ 2016年民航机场生产统计公报. CAAC. 24 February 2017. ^ 民航局与上海市人民政府在沪签战略合作协议 (in Chinese). Carnoc. 6 April 2012. ^ "Runway at Hongqiao ready for flight test". 10 January 2010. Archived from the original on 6 May 2010. ^ Yang, Jian (31 October 2014). "Airport renovation biggest since it opened in 1921". Shanghai Daily. Shanghai Daily. Retrieved 25 April 2017. ^ a b Yang, Jian (21 March 2017). "Hongqiao airport gets its biggest facelift since its opening in 1921". Shanghai Daily. Shanghai Daily. Retrieved 25 April 2017. ^ "China Eastern Airlines Corp. Ltd. (CEA)." Yahoo! Finance. Retrieved on 3 October 2009. 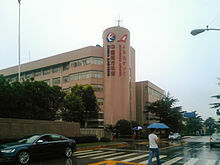 "China Eastern Airlines Corp. Ltd. 2550 Hong Qiao Road Shanghai, 200335 China – Map"
^ "Directory:World airlines." Flight International. 25–31 March 2003. 45. "Hongqiao International Airport, Shanghai, 200335, China"
^ Incident: Incident: Qatar B773 and Juneyao A320 near Shanghai on Aug 13th 2011, fuel emergency or not. The Aviation Herald. 24 August 2011. ^ Accident: China Eastern E145 at Shanghai on Jun 7th 2013, runway excursion, nose gear collapse. The Aviation Herald. 7 June 2013. ^ "Two China Eastern Jets in Runway Incursion at Shanghai Hongqiao Airport". China Aviation Daily. Retrieved 16 October 2016. ^ "Shanghai metro reaches Hongqiao Airport". Railway Gazette International. 16 March 2010.